ABAP developers who has ABAP BSP coding experience can easily understand how the background displayed on main page of the SAP Screen Personas can be changed. Although I like a blue background with birds flying feeling a freedom, for an enterprise SAP Personas application it is better to use an image suitable to use a logo, etc of your company. SAP Personas administrators will remember that the main starting webpage is the SICF MainApp service address. The MainApp is seen in the URL. Also the BSP is in the target URL. Index.html is an other important hint for us to trace the hints for solving how we can change background on Personas. 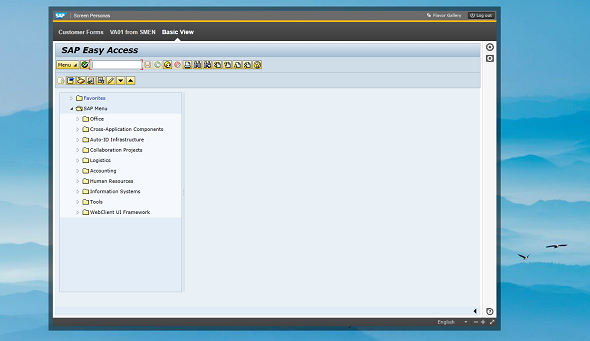 So first of call, call transaction SE80 Object Navigator on SAP GUI. 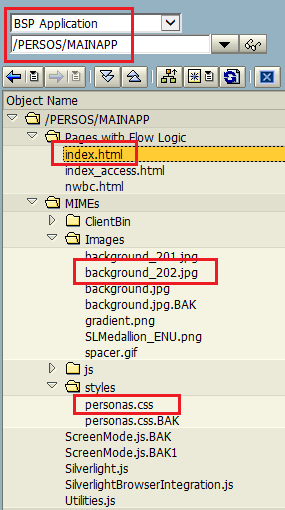 ABAP developers can see the main includes that are related with SAP Personas index.html page, personas.css page for formatting, and images used as background in the web application. If BSP developer display index.html in code editor, it is easily seen that personas.css defines the screen elements' properties. And if CSS file is opened, the background image is set as "/images/background_202.jpg" which is the blue screen with birds flying. In order to alter or change background image in SAP Personas application, right click on "Images" node within BSP application project. Then using "Import MIME Objects" upload a new image which you want to set as new background image for the SAP Personas application. As the next step, change the "background-image:url" with the new background image's path and name. Now BSP programmers are able to modify the Personas MainApp BSP application and change background on main Personas screen.